Center for Learning, or Green Bike Co-Op in Waldport, Oregon. Writing Groups – With an emphasis on self-expression, students improve reading, writing and social skills as they share their work, engage in discussions and experience peer-to-peer feedback in a fun and supportive group setting. 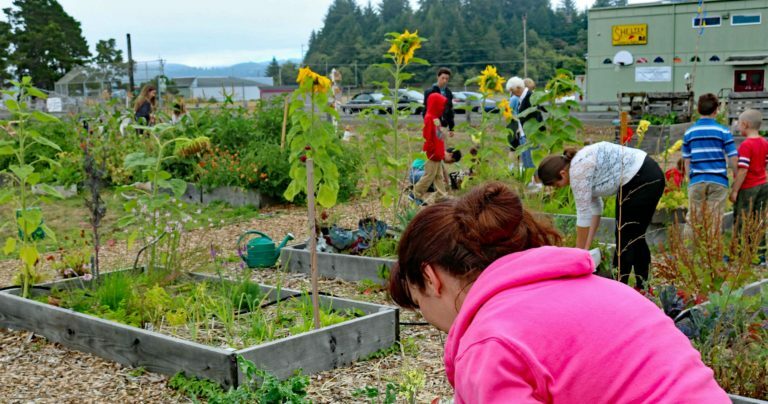 JOY Community Garden –The garden is a gathering place and outdoor learning space, serving as a “classroom” for hands-on lessons in service, environment and horticulture. Adult Literacy –One-to-one tutoring and GED prep help is available to adults at all stages of learning. Volunteer & Vocational Training –Comprehensive training provided quarterly, including CPR, Food Handlers classes, Darkness to Light, Mental Health First Aid, Basic Computer skills trainings. Summer Camps –Summer day camps offer youth educational and interactive fun activities in the areas of music, art, science, math, reading, writing, gardening and more! DaNoble House provides support for children and adults in improving literacy. Free Tutoring, after school and summer programs, GED support, and more are provided at 125 NW Spruce St. in Waldport, Oregon. Click here for more information on what we do. Created by Seashore Family Literacy as way to promote good health and recreation, the Green Bike program provides free bicycles for anyone to ride, vocational training and volunteer opportunities. Working in partnership with the Greater South Lincoln County Community, the facility is used for a wide range of activities, programs and weekly community dinners. The building is being renovated as funding becomes available. Seashore’s Community garden and outdoor classroom serves as a source for fresh produce, gathering space, learning zone and natural play-area. Fruit and Veggie Stand coming Summer 2016!